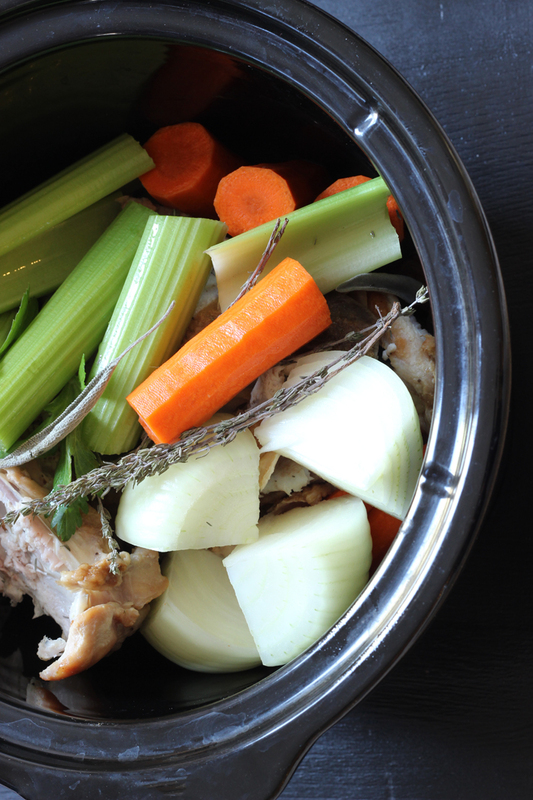 Save time after your holiday meals by prepping your turkey stock ingredients beforehand. You’ll save motions and make stock-making so much easier. Everybody knows that homemade chicken or turkey stock is tastier than the can. And it’s a frugal way to stretch your original purchase of fowl. After all, making turkey stock is practically free! Just load a pot — or even a slow cooker — with the leftover bones and drippings as well as some vegetables, aromatics, and water. Simmer and in a few hours you’ll have liquid gold. Well, let’s turn off the Martha Stewart Special and talk turkey, shall we? The truth of the matter is this: Turkey is generally saved for special occasions, ie. Thanksgiving and Christmas. On these particular feast days, there are a lot of bells and whistles to prepare. All the side dishes! the desserts! the fancy tablescapes! Who in their right mind has any energy left after it’s all done to lug out the ingredients to cook something else (that turkey stock) — even if it IS practically free?! hidden the whole affair deep in the refrigerator in the hopes my energy will return. stashed it in a freezer bag in the freezer for another time. or chucked it all in the trash due to exasperation! Except for last year. Last year, I had a revelation. It just may have been a divine revelation. It is that important. These are turkey stock ingredients. Why would I want to haul out the cutting board and the knife and mess with all this after Thanksgiving Dinner when I could do that prep work NOW?! When I say this has been a GAME CHANGER, I’m not exaggerating. I’ve never read this anywhere before and I wonder why in the world I haven’t heard about this before. I’ve been cooking turkeys for well over 20 years and no one ever told me to …. Prep your Turkey Stock Ingredients in advance. So, now I’m telling YOU. Call it a little love and friendship. As you go about preparing your roast turkey — or even roast chicken on a regular night — put aside a quartered onion, some celery and carrot sticks, and whatever other turkey stock ingredients are your faves. Box it up and stash it in the fridge until after dinner. Then, after dinner, as you’re cleaning things up, drop the turkey stock ingredients and the leftover bones, skin, and drippings into a pot of water, a slow cooker, or even a pressure cooker. Simmer for several hours, and voila! 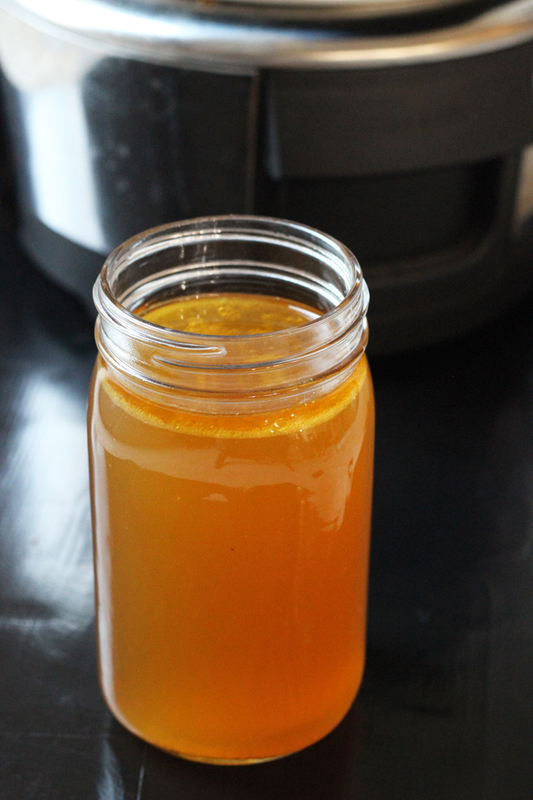 You will have beautiful homemade turkey stock. Only, none of this really takes any extra work, so it does, indeed, feel like you made something from nothing! What can you use for turkey stock ingredients? In addition to the turkey bones, drippings, and other bits from a roast turkey, there are a number of different turkey stock ingredients that you can mix and match. Think about how you want to use the turkey stock later and match that flavor profile. How long does turkey stock need to cook? 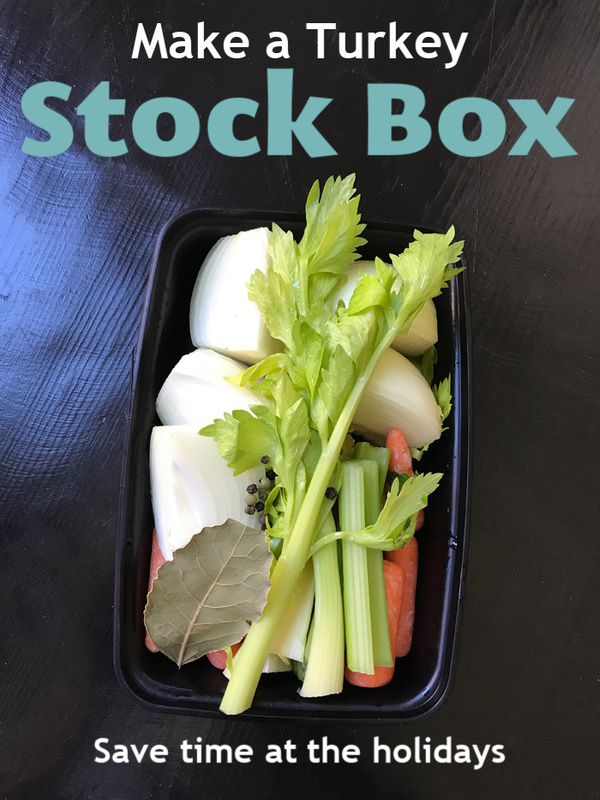 How can I store turkey stock? Store homemade turkey stock in covered containers in the fridge for up to 4 days. For making it ahead, freeze in freezer-safe containers, leaving room for expansion. Freezing your stock will then make for a quick weeknight soup. Stocks and soups are one thing I always make sure to have in my freezer. Since stock is mostly water, it can take up a lot of space in the freezer. To save space, you can reduce it by simmering for an hour or so. The stock will become more concentrated and less in volume. You can dilute it with water later when you use it. What do you use turkey stock in? What do YOU do to make the most of your Thanksgiving prep? Head to the comments section and let’s chat! This is such a smart idea! I hate food waste, so Thanksgiving is probably the best time to stock up on all those scraps so I can make bunches of stock for the winter! :]! What? Game changer, for sure! Why have I never thought of this before either?! Thank you!! That’s what I said all Thanksgiving week last year. LOL! 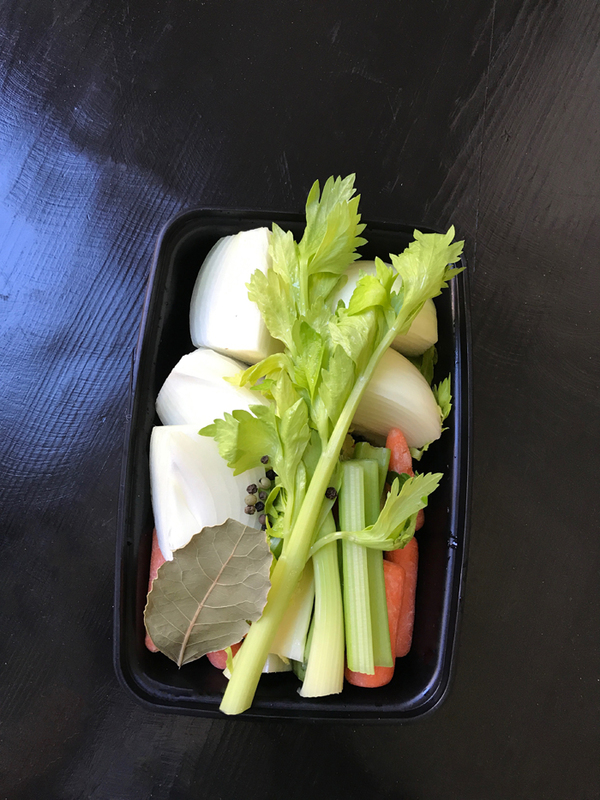 I do my turkey stock in the slow cooker overnight after Christmas and Thanksgiving dinners – If I deal with it immediately, it’s no big deal for some reason. Ham bones are always used for ham and white bean soup with kale (my favourite) and leftover ham gets cubed up and frozen to add to macaroni and cheese (my kid’s favourite). I always make way too much holiday meal so that we can use the leftovers afterwards and I basically won’t have to cook for a week – straight up leftovers, hot turkey sandwiches, turkey pot pie, croque monsieur sandwiches, soups. Veggie sides can be turned into veggie soups, stuffing added to hash for breakfast, and I learned to make Thanksgiving cupakes from a friend of mine – in a cupcake tin, freeze your turkey dinner leftover items in layers – stuffing on the bottom, meat, veggies, topped with mashed potatoes. Or you can make “stufffins” out of leftover stuffing/dressing – pack scoops of stuffing into cupcake tins and freeze. Freeze these and they’re excellent quick meals afterwards – perfect for kid’s thermos lunch, too! So we go to town on leftovers, and I love it. Great suggestions, Tina! Thanks for sharing. I have been keeping a gallon bag of trimmings in the freezer for years! SO handy! Then when I have a carcass or enough trimmings from my bulk poultry purchases I started a pot.. I had my bag ready last week! Made it so easy on Friday to toss it all into a stock pot and simmer away! This is a great idea, thanks for posting it. This year, my cousins purchased and reheated two giant turkeys, and we all brought sides and desserts, for a big party of 35 people. Afterwards, I realized my cousin was going to toss the turkey carcasses, so I volunteered to take them home. Gave one to my sister. I pulled about 2 more cups of meat off each carcass using my hands, then we both made turkey stock, and later some turkey noodle soup. It really is free when someone gives you the carcass! So if you’re eating at someone else’s house, speak up if you think they aren’t going to use it.